On this week’s podcast, we talked to David Pepper, the Chair of the Ohio Democratic Party, about the fact that Donald Trump is the most anti-worker president we’ve ever had. The truth is, America in 2019 is corporate utopia. We have almost everyone working and wages remain low. How is this possible, you might ask? How is it that wages aren’t going up since there is competition for jobs? Doesn’t the magical free market demand that wages increase as employers compete for workers? In a world where corporations felt even a slight moral imperative to do right for our citizens, that would probably be the case. But that is, of course, NOT the world we live in. In fact, if corporate leaders don’t do everything they can to maximize shareholder wealth, they will be replaced or, in some instances, sued for failing to attend to their fiduciary responsibility to maximize profits. So, in this world, corporations are incentivized — indeed the people running these corporations are handsomely rewarded — to keep wages low. But it’s not just a matter of corporations agreeing to a silent wink-wink compact to depress wages. In order to maintain the structure, they need two other things: a low minimum wage and weak or non-existent unions. This is why you see so much time and money and effort being spent by the DeVoses and Kochs of the world. 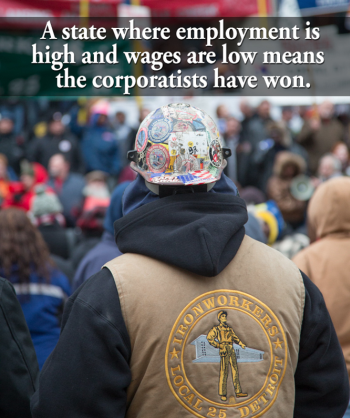 They need to keep workers from rising, both economically and organizationally. The minimum wage is the baseline from which all other wages are measured so keeping it low is essential to their model. And without the ability to effectively bargain collectively for better wages, benefits, and working conditions, workers have no power to change anything. It’s easy to get fixated on the criminality of Donald Trump and his administration but as we move into the the 2020 election season, Democrats should make sure they are stepping up to support minimum wage increases across the country and to make it as easy as possible for workers to form and join unions. As bad as things are for workers now in this time of a good economy, they will only get worse when times are tough. And those times are right around the corner. Fighting for these things along with universal access to affordable healthcare and an end to racism and bigotry in all their malevolent manifestations should be Democrats’ top priorities. The candidates who make these their top priorities and talk about them every chance they get will rise to the top. Let’s all make sure they do.